This is a very challenging set of student work to look at as a teacher. It’s tempting to just mark this up as “confused about how to deal with complex equations,” but just look at all the moving parts! There are so many things going on here, and so many things that all of these kids know how to do. For example, each of these kids distributes — not entirely correctly, but they do distribute. In particular, not every kid handles the sign correctly — a bunch of kids are during 0.2(d – 6) into 0.2d + something. That’s interesting, and a discrete algebraic move that we could focus on later. And then there is the multiplication of 0.2 and 6. Unclear whether that’s a mistake these kids would make under calmer situations. So much complexity here! I’m sure there’s more that I haven’t noticed. Posted in Expressions and Equations, Solving Linear Equations. What does this student already know? In other words, what don’t you have to teach again? What’s going on with the distribution? You’ve got time for a 5 minute activity to help this student. What activity do you pick? Here are four equations, each using similar numbers. Which one would be the most difficult for a student to solve? Conventional wisdom is that this question is too complex to really grapple with; it depends on the kids, the class, what they’re studying, etc. I think the conventional wisdom has a point, but I know that I’ve learned a lot about the differences between these four problems, and there ought to be a way to teach what I’ve learned to others. Of course, only other people can be the judge of whether I know something worth teaching! Here’s a rough attempt to get at some of the pedagogical structure that underlies these problems. Part of the problem with trying to make generalizations about how kids will tend to struggle or succeed in solving equations is that there are MANY ways to successfully solve an equation. I can’t say, “when kids see bla bla bla they do bla bla bla,” because just as many kids will as won’t do that, and it largely depends on the approaches to instruction that the teacher takes with the class. So I want to play with the idea that it can be helpful to think of an equation as having triggers that can activate various strategies that a kid might potentially use for an equation. Just to get weird: a kid could multiply both sides by -1, add x to both sides, then perform 12 – (-9). Just treat it like an arithmetic problem — what minus 12 is 9? The idea I’m playing with is that the equation contains a trigger for using an arithmetic strategy, i.e. a strategy that depends on no new algebraic metaphors, procedures or ideas, just whatever knowledge of the operations and arithmetic a student comes into this work with. I want to be clear about two things. First, I’m not claiming that all students are going to approach this equation using arithmetic. Instead, I’m saying that these equations are especially well-suited for arithmetic, and a student who uses arithmetic sometimes to solve equations would very often use it in x – 12 = 9. Second, I think that arithmetic is generally something that students have had a lot of experience in, compared to algebra. By the time an 8th Grader gets to an equation like x – 12 = 9, thinking about this equation in terms of arithmetic is likely to be productive and yield correct and helpful thoughts about the equation. So, here’s a big generalization that I want to throw out there: equations that can trigger arithmetic are going to tend to be easier for kids. Their earliest work identified a taxonomy of addition and subtraction word problem types. Different problem within this taxonomy are differently difficult for children even when the “arithmetic” remains constant. For example, “Tom had 11 apples, and then lost 3 of them, how many does he have left?” might be easier for a student to represent than “Tom has 11 apples and 3 of them are spoiled, how many are not spoiled?” as the former problem has an action that a student can act out using counters, paper or some other representation. Different arithmetic word problems trigger different strategies, even when they use the same numbers. And they have a systematic way of thinking about it! Here is my understanding of the way arithmetic works. Kids form meaning of the operations in terms of contexts and word problems that are naturally associated with actions. So, subtraction gets associated with taking stuff away , and that meaning is there even when the contexts aren’t. Attempts to give kids alternate ways of seeing the operations are hard precisely because the operations are built so snugly on these paradigmatic actions. This determines which strategies get triggered by various subtraction problems, even without contexts, and even when they contain the exact same numbers. And here’s a particular example, connected to the equations above: x – 12 = 9 and 21 – x = 9 are not the same type of problem. The first has the start as an unknown (if you think about it as an arithmetic problem, aka with the paradigmatic meaning of something takeaway 12 is 9); the second has the change as the unknown (aka there was 21 and then some got taken away and now there’s 9). Neither equation is particularly easy to think through using arithmetic, but there’s a strategy available to young students for 21 – x = 9 that isn’t available for x – 12 = 9. To solve 21 – x = 9, you can go down from 21 until you get to 9, i.e. 21 minus 10 is 11, minus 11 is 10, minus 12 is 9, got it! 12! You can’t really do that for x – 12 = 9 because you don’t know where to start. You’re left with trial and error. Of course, trial and error was an available strategy for 12 – x = 9 too, so there are fewer approaches available for x – 12 = 9. In other words, if you think about it in terms of arithmetic, x – 12 = 9 is probably harder for students than 12 – x = 9. You could think about this as arithmetic, but the arithmetic would not be a friendly way to go about this since the numbers are not so amenable to the strategies and experiences of arithmetic. That’s a precise sense in which this type of equation is more difficult — arithmetic would be unavailable to students who might solve it, and they’d have to rely on newer, more algebraic approaches. It seems likely that students would not tend to use arithmetic naturally on this because it’s so much more complex looking than a typical arithmetic problem. At the same time, kids can learn to use their arithmetic on this type of problem, and for a lot of kids this can be productive as they’re getting the hang of algebra. 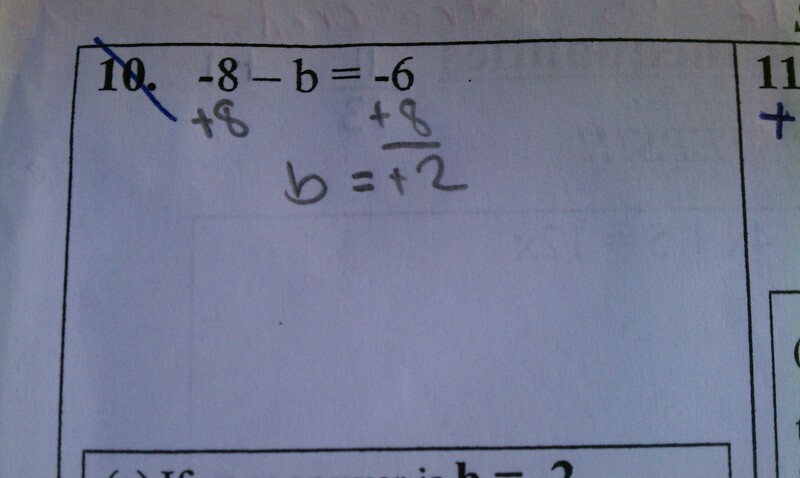 If a kid is comfortable with arithmetic, they could think of this as 21 – BLA = 9. BLA must be 12, so 10x must be 12, so x must be a tenth of 12, or 12/10. Some people call this move “covering up” or “chunking” the equation, but the point is that it extends the power of arithmetic to apply to a greater class of equations. Precisely because 10x – 12 = 9 is tougher on the arithmetic, it’s less likely for “covering up” to be helpful on this problem. So this a precise sense in which 10x – 12 = 9 can be tougher than 12 – 10x = 9 — there’s a strategy for one that the other doesn’t have. That said, there are other interpretive issues that could arise for 12 – 10x = 9 if you use a more algebraic technique that wouldn’t arise for 10x – 12 = 9. In particular, the metaphor of undoing or unwinding (i.e. inverse operations) fits more naturally with 10x – 12 = 9 than 12 – 10x = 9. So that’s another precise sense in which one of these equations is trickier than the other. In practice, I’d predict that 12 – 10x = 9 is easier for students very early in instruction who would be more likely to be triggered to use arithmetic, whereas later in instruction when kids have learned algebraic techniques 10x – 12 = 9 would be easier, because it fits better with the unwinding/undoing way of seeing an equation. So, in short, not only are equations that have arithmetic triggers maybe easier, but equations that can be covered-up to allow arithmetic to hook-up with a student’s thinking will also be easier. This is rarely (never?) the way equations are presented to kids in texts or by teachers, though. I think the dominant approach is to classify problems by surface-level complexity and to vary everything else, in the hopes that kids will get exposure and practice with all these different types of problems. My point is that there is no organized, principled, systematic way that we have of thinking about the various different problem types of equations, so we just typically put them all in a blender and then present them to students all at once. And then we spot-check the difficulties for months and months. And my theory is that if we have a theory of the problem types and micro-skills that give equations their underlying pedagogical structure, we might be able to design better resources and teaching for kids in this skill. And my other theory is that if we’re attuned to this sort of thing, even if we don’t have a system, meaning if we’re looking out for these sorts of problem types and micro-skills, we can generate better feedback and responses to the stuff we see kids have trouble with in class and on assessments. Posted in Expressions and Equations, Reasoning with Equations and Inequalities, Solving Linear Equations. I’ve been begging people lately to send me their solving linear equations mistakes. As long as people indulge me, this will be a series of posts devoted to thinking aloud about what sorts of linear equations are hard to solve, and what it is that makes them hard, and what exactly it means to know how to handle every equation that’s out there. The goal I have in mind is a way to be able to teach a (relatively) new teacher what sorts of equations they can expect their students to struggle with and (ideally) how to systematically teach this stuff so that kids see all the cases. (Besides for the obvious, e.g. an equation with lots of stuff in its that requires a ton of steps). I think there are a lot of things that make this hard. I don’t know about Michelle’s students, but fraction multiplication is touch-and-go with my students, so there’s that factor. One of the most important little “micro-skills” relating to equations that I teach my students is about scaling equations up so as to eliminate fractions. I think that would be useful here. There’s an interesting choice about whether to do that scaling before or after distributing. That’s another interesting little choice that a student would have to make. I could imagine designing a little activity centered on a bit of strategy: when does it make sense to scale up? I think the message to kids could be that if you scale up before distributing, you might get to avoid some fraction arithmetic. Maybe the activity could look like this. You start with that equation and then you present two options. And then you offer some prompts to draw attention to the choices you get to make? Just be explicit about the mistake…we scale both sides by -6, but the left side ends up only getting scaled by 6. The fractions seem sort of incidental to this one. Maybe this is related to the thing where multiplying by a negative feels like it should make the stuff negative, rather than giving everything its opposite sign? To what extent is this an equations mistake vs a negatives mistake? Lots going on here. The idea that we’re scaling both sides vs. just the fractions is tricky it seems. Clearly fractions make an equation tricky to solve as it presents a number of conceptual issues. To what extent is it helpful for a teacher to understand anything about how kids handle equations with fractions besides “with difficulty”? It seems like all the interesting choices to make when handling equations with fractions are about finding ways to transform that equation so that we can avoid those fractions. I didn’t know what to say when she got stuck, exactly, but I was fairly confident that this was an example of a micro-skill that she was missing. My student read the example and then exclaimed (in a way I can only describe as “joyous”), Oh wait, you can make 0 there?! Micro-skills: Knowing that you can make 0. Check out the bottom right. This pair of students got frozen at y = 2y + 5 because they subtracted y from each side and then weren’t sure if they were allowed to end up with 0. (Two years ago I talked to these kids about this, so I’m not guessing from their work.) This seems identical to the situation that this year’s student. The moral of the story to me is that making zeroes is something that students need “permission” to do. Not like permission from me, the mathematical authority. I just mean that it seems to be something that beginners need help realizing is a kosher move. As long as this picture is here, another little decision that kids need to make (see top-right) is whether to add or subtract something when trying to use a balancing move. Posted in Expressions & Equations, Expressions and Equations, Reasoning with Equations and Inequalities, Solving Linear Equations. Last week I posted a short video from a tutoring session I had with a kid. We were solving equations, and he had some interesting ideas, and it was nice to have those ideas and his mental workings become explicit. Help me understand his thinking. How did he devise his test for whether his solution is correct? What does this say about what he thinks about 2/0? Or jump in with whatever you like in the comments. Describe, as best you can, the way that this kid thinks about the Distributive Property. What would you say next, if you were me? Looking forward to a great bunch of comments here. Don’t let me down? Why do kids make this mistake? Posted in Interpreting Functions, linear functions, Linear, Quadratic, and Exponential Models*, Solving Linear Equations. a) Would this kiddo always make this mistake, when presented with an expression to simplify? 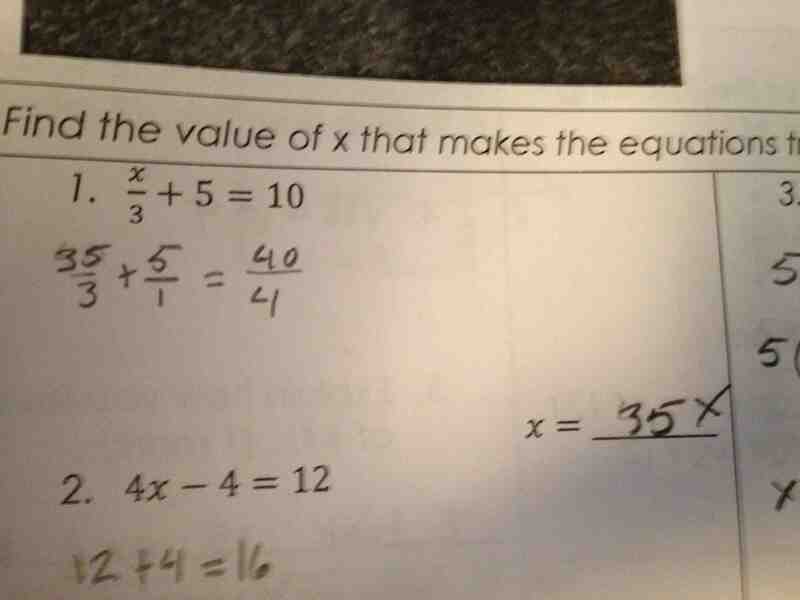 b) If not, then what exactly is it about this problem that prompts the kid to employ a basic move from equations? Posted in Expressions and Equations, Simplifying expressions, Solving Linear Equations.